Starting an Art, Design or Engineering course at college or university? – or any course that involves manual drawing work? Make sure you’ve got the right equipment – browse our huge range of Art, Design and Drawing equipment and materials online. If you are a Course Leader or Technician looking to supply your students with all the equipment they need for their course, we can help simplify your process with our Bespoke Student Equipment Kits. Simply contact us with a list of items your students need and we will set up a bespoke ‘kit’ product unique to you, which will contain only the specific items requested. 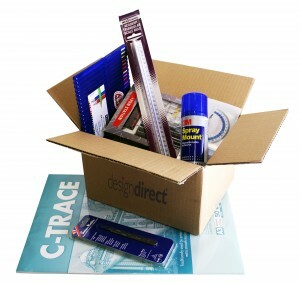 We will then supply these kits as pre-collated, individually packed and labelled with your student names if necessary. You can either order your student kits in bulk and have them delivered direct to your college/university, or alternatively we can put your bespoke student kit product on our website available for your students to purchase online for themselves. For more information or prices, please contact us using this online form; email sales@designdirectsupplies.com; or phone us on 0800 013 2514. We are a well-established UK distributor of top brands such as Staedtler, Rotring, Jakar, Helix, Linex, and more.